Kitchen gadgets are easy to accumulate: they are fun, encourage you to cook and make excellent gifts. One measure as to the usefulness of any kitchen gadget is how many degrees separate it from being a unitasker. Any device meant to do one thing is just going to end up cluttering up the junk drawer. If a gizmo can do two things, great. Three things, even better. But four? Hey. I’m on board. Okay, this Zyliss 4-In-1 Multi Slicer/Grater might be pushing it, as almost any grater will at least offer the choice between fine and course, but not as many can handle slicing too. 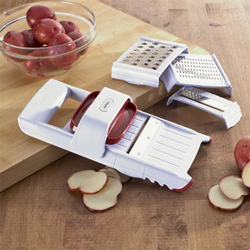 If you got a mandoline hanging out in your kitchen, there’s a good chance it doesn’t do any grating (although many do). Likewise for your grater, the slicer portion can be woefully inadequate. With the added bonus of a finger guard, this grater-meets-mandoline makes for a fine addition into the collection of kitchen gadgets designed to do more than one thing.